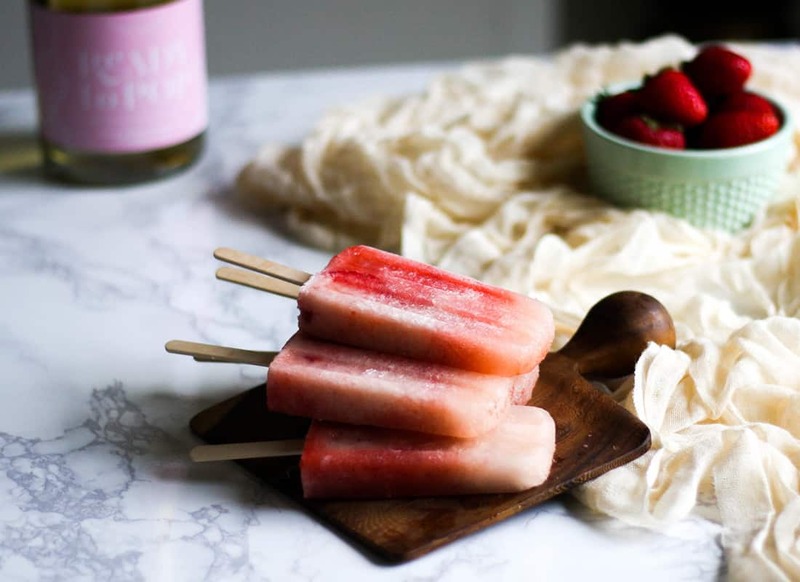 Today I’m sharing with you what might just be the best thing I’ve ever made, and no, I’m not referring to these Prosecco Popsicles (although, I have been told they rock). That’s right, I didn’t even taste test my own creation. I enlisted friends to test them over the fourth of July, while I dug into the non-alcoholic version that I’m lovingly calling “Ready To Pop-sicles” (hint #1). The best thing I’ve ever made, let’s call the thing “bun”, has ironically made me really, really sick over the past few months. The bun made itself comfy in my tummy and wrecked havok on my world, but I think bun and I have finally worked out how to cohabitate peacefully (hint #2, #3, #4…). If I haven’t made it clear yet, MY EGGO IS PREGGO! I have a little rainbow baby girl wiggling around in my tum, getting all ready in there for when it’s time for her to come out and play. 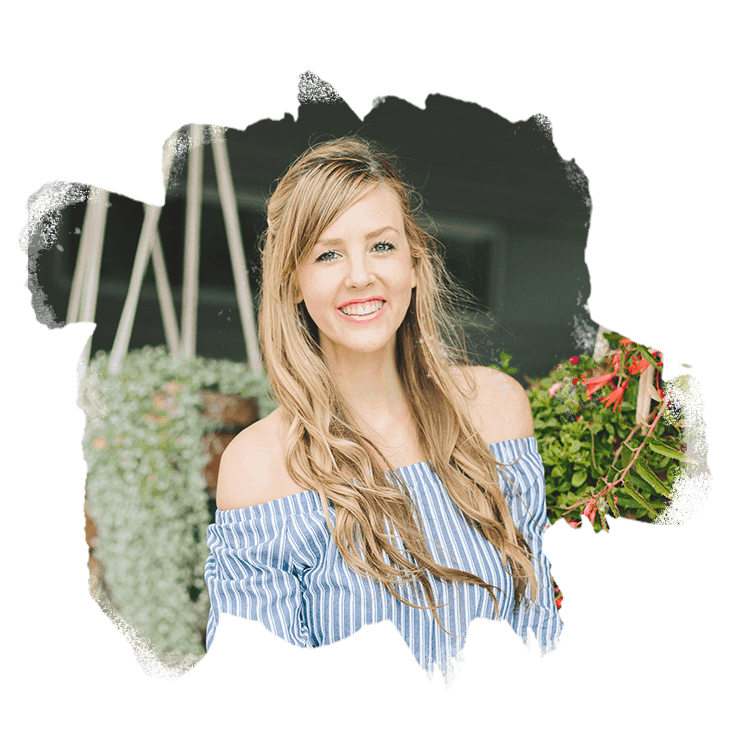 I’m planning to share a few pregnancy related posts on the blog like pregnancy after miscarriage, how I coped with severe morning all day sickness, and the natural methods I tried to combat the nausea and vomiting. But that’s all for another day. Mama’s tired. 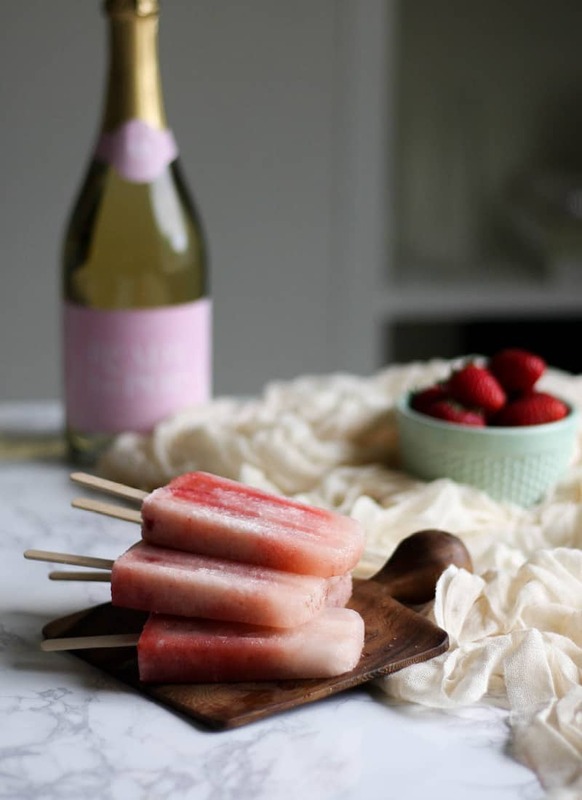 Now that I have that news out of the way, let’s get onto the Prosecco Popsicles! Being as I’m from the US where there are sadly no Prosecco Popsicles available for purchase, I had no idea what to expect when making these. Would they explode in the blender? Would they explode in the freezer? Would the texture be different? The first batch I made had a small amount of strawberry puree in the bottom of the mold with prosecco simply poured over top, and I will say they texture was definitely off. Like I said earlier, I force fed these to our fourth of July guests, and they ate them, but… not with great enthusiasm. It was more of eating for a buzz, rather than eating for enjoyment. 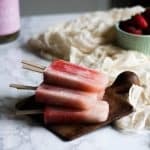 The final recipe I settled on had the fruit blended throughout, along with a bit of fat from the coconut butter, both of which helped the Prosecco Popsicles have more of a traditional popsicle texture. Win! They’re still a bit “icy” in texture, but it’s not off putting at all. Like I said before, the consensus is: they rock! 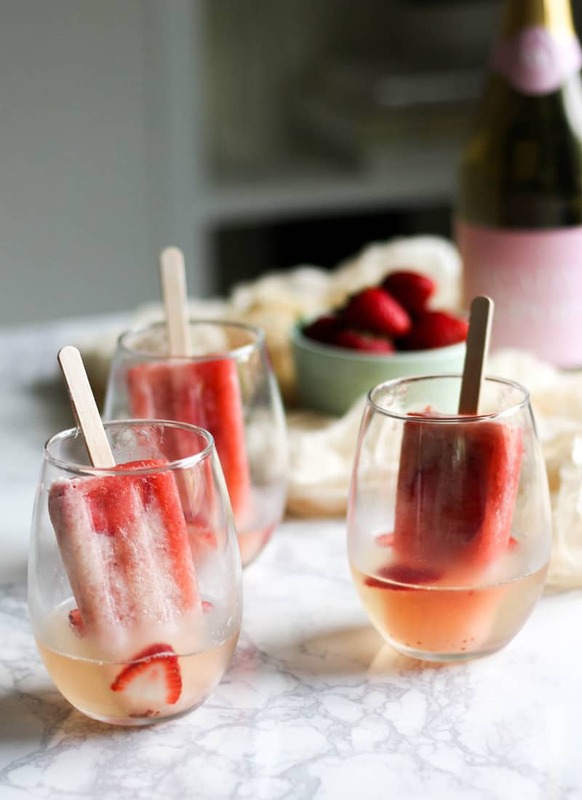 Now let’s chat about the “Ready to Pop-sicles”, aka non-alcoholic Prosecco Popsicles, for all the pregos and alcohol avoiders out there. I tested the non-alcoholic option two ways, both of which are winners! The first option is to buy a good quality sparkling grape juice from your local health food store. If you can’t find a good brand without corn syrup, you can also try a strawberry flavored kombucha. 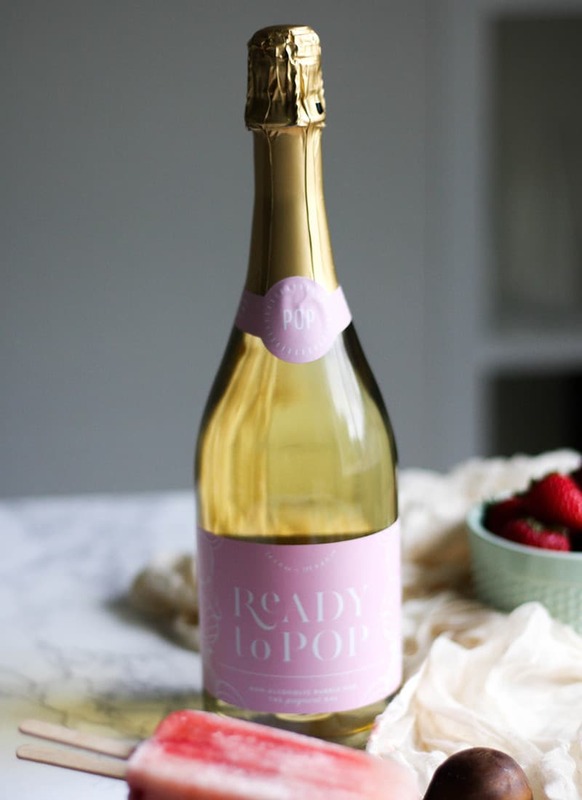 The second option I tested included a brand of non-alcoholic bubbly called Ready to Pop (this will definitely be at my baby showers, btw). As I mention in the recipe, I don’t recommend including the sweetener if you’re making the non-alcoholic version, since all of these options are already sweetened much more than prosecco. So whether you’re in it for a buzz, or you’re just in it for the non-alcoholic fruity flavor, hop on the Prosecco Popsicle train. You won’t be disappointed. Add frozen strawberries to a high powered blender along with 1 1/2 cups prosecco or sparkling grape juice. If you’re using prosecco, you may want to sweeten this strawberry mix slightly. Add 1/4 cup honey or maple syrup if you’re wanting them a little sweeter, but I recommend omitting the sweetener if you’re using sparkling grape juice. Pour into popsicle molds (I used this one), filling about 2/3rds the way up the top of the mold. 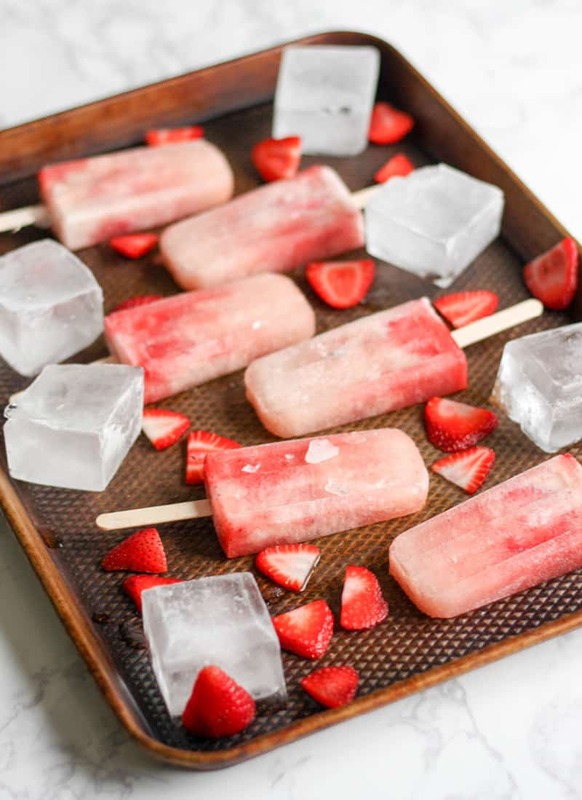 Add sliced strawberries to popsicle molds (optional). Clean blender and add 2 Tbsp runny coconut butter and remaining 1 cup of prosecco or sparking grape juice. If your coconut butter has solidified, heat it over low heat so the coconut butter melts and is runny. Blend well. Slowly add coconut butter/prosecco mix to the popsicle molds, leaving a bit of room at the top as the popsicles will expand as they freeze. Pouring the mix in slowly will swirl the strawberry mix with the cream mix and make the finished product really pretty! Freeze for about an hour before inserting popsicle sticks. Freeze until solid. To loosen the popsicles from the mold, run hot water over the bottom half of the mold to release.